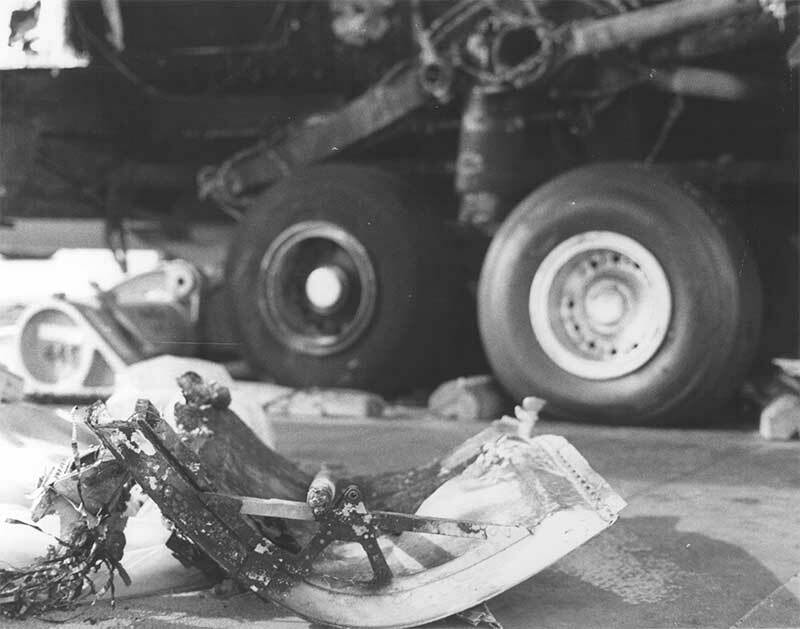 Synopsis: After landing, the failure of a brake system part caused a hydraulic leak and subsequent fire, made worse by an aircraft design deficiency. The crew made an uneventful PAR approach at MCAS 29-Palms. During landing rollout, the engineer noticed the failure of #2 Hydraulic system. The crew brought the aircraft to a stop on the runway and selected "Emergency Brakes". With normal gear indications and pressure on #3 hydraulic system, the crew decided to clear the runway before shutting down the engines. As they cleared the runway, #3 Hydraulic system failed. The pilot used reverse thrust to stop the aircraft. The scanner deplaned to pin the gear and was met by members of the base fire department, who told him the aircraft was on fire and to evacuate the aircraft. The crew quickly completed the "Fire on the Ground" emergency checklist and evacuated the plane without injury. The base fire department extinguished the fire, but not before it had caused substantial damage to the aircraft. 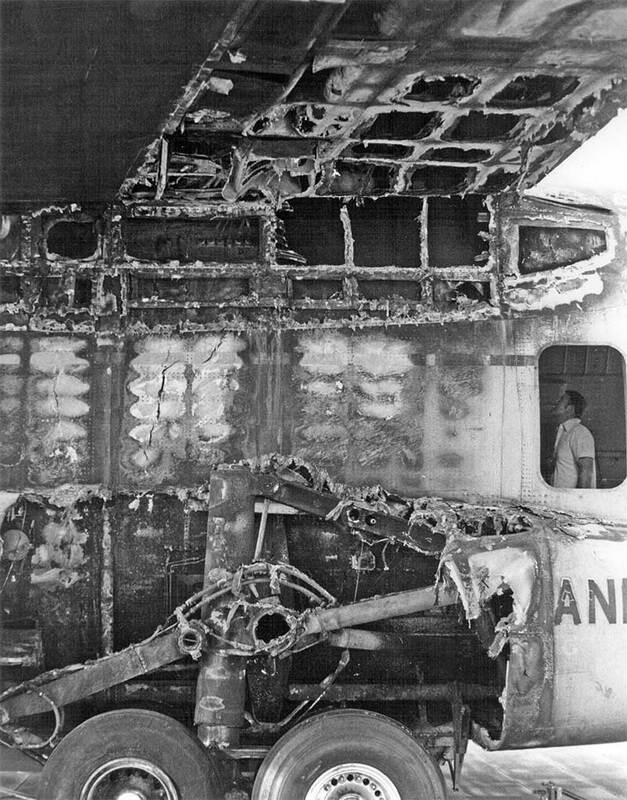 Because they had flown a PAR, the crew was still on approach control frequency and had not switched to tower frequency, before the loss of the #2 Hydraulic system. They did not hear the urgent warnings from the tower about the fire in the landing gear on "Guard", because neither pilot was monitoring the frequency. The engineer, who was monitoring guard, was distracted fay the emergency, and also failed to hear the tower's warnings. Investigators found that a brake swivel, on the right landing gear, had separated, spraying #2 Hydraulic system fluid on the brake and starting a fire. As designed, the fluid stopped automatically when the hydraulic fuse set after 20 cubic inches (approximately 11 ounces) of fluid had sprayed out of the swivel. Under the brake system design at the time, the emergency brake system was not fuse protected. 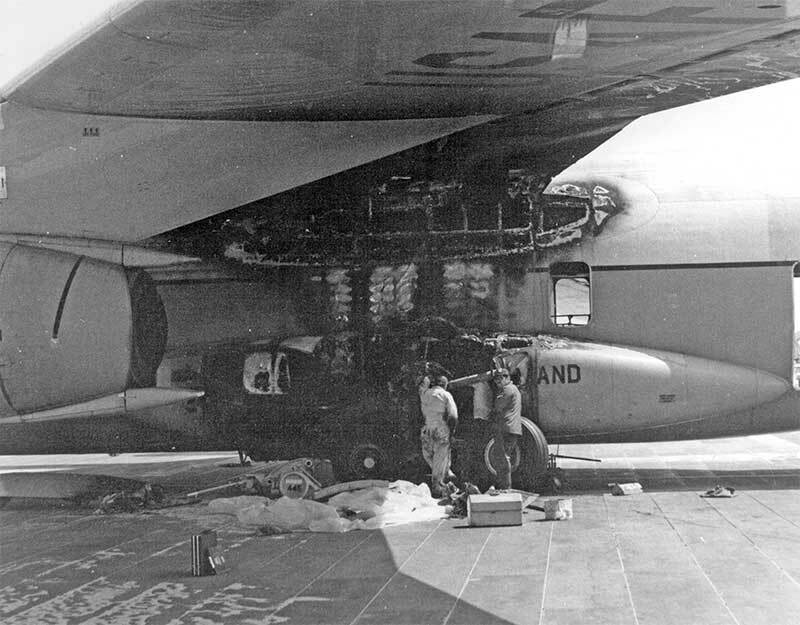 While the fire would have gone out almost immediately, after the #2 Hydraulic system fuse set, the selecting of "Emergency Brakes" dumped the full pressurized fluid of #3 Hydraulic System on to the fire, greatly intensifying it. As a result of this incident the brake design was modified to fuse protect both Normal and Emergency brake systems. I'd like to clarify some points to the story. The Crew operating the aircraft that day was assigned to the 15th MAS and I was was performing Scanner duties. We had departed Norton AFB enroute to MCAS Cherry Point, with a stop at Twenty Nine Palms MCEAF. We were ferrying sufficient fuel for our flight from Twenty Nine Palms to MCAS Cherry Point. Lockheed engineers later determined this may have saved the aircraft, that and quick action by the Marine Firefighters. After an uneventful landing utilizing max reverse and minimum braking, we cleared the runway and taxied to the ramp. We parked behind another Starlifter and began running the appropriate checklists. JD Harston was at the panel. 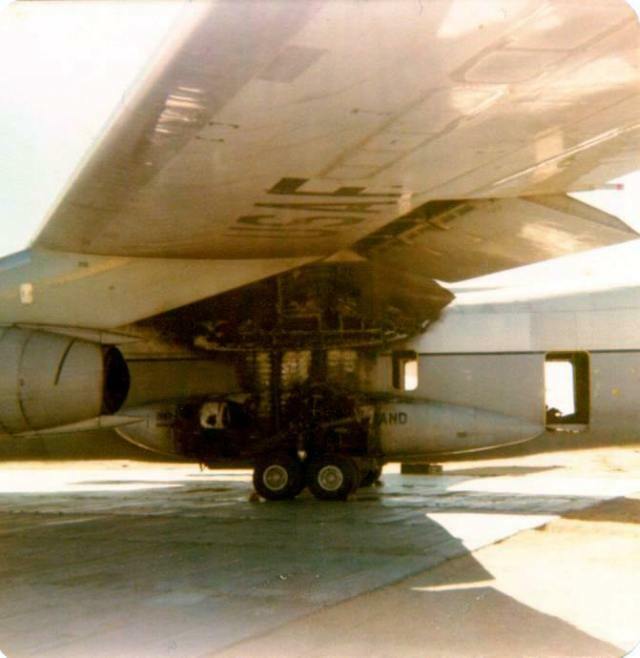 When the AC gave me clearance to depart the aircraft, I opened the door and attempted to hand the Crew Chief the gear pins and noticed he was several yards off to the left of the nose pointing at the left wheel well. I turned and saw the entire wheel well engulfed in flames. 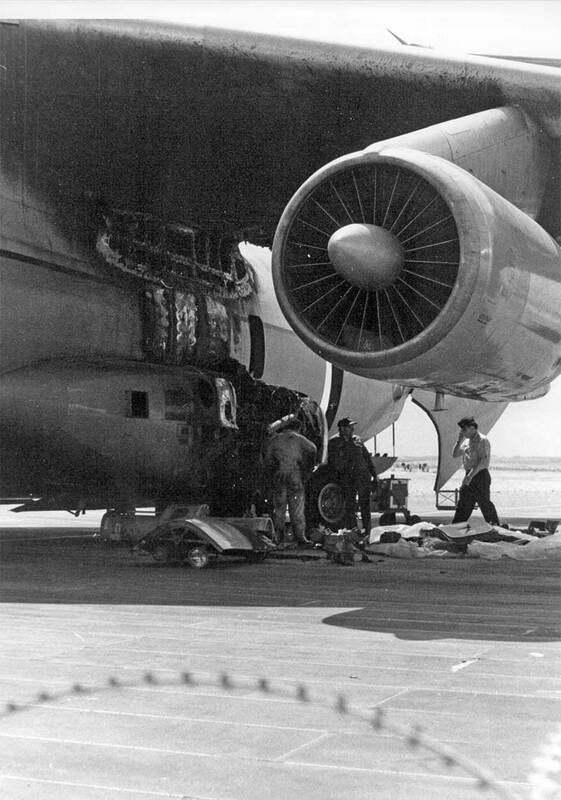 I notified the rest of the crew of the emergency and they evacuated the aircraft with the the three pilots and engineer exiting out the crew entrance door and the two loadmasters exiting out the troop doors. 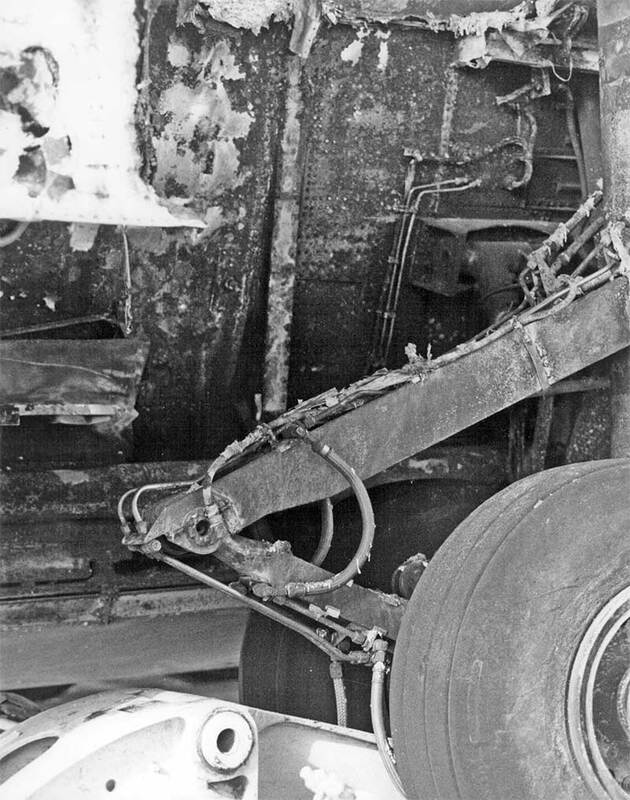 The accident investigation board determined that the cause of the accident was that the #5 brake swivel separated from the brake when emergency brakes was selected depleting the #3 system on the hot brake. It was also discovered that during taxi in there was a hydraulic leak coming from the left gear and may have contributed the the incident. If you would like any further details please don't hesitate the ask. The photos below are of the aftermath of the fire. These are Air Force photos submitted to the site by Bill Weeper.